Discussion in 'Member Introductions' started by VintageGirl40s, Oct 23, 2018. Hi, I'm new here and want to know about refillable carts. I currently have No printer, but am considering ordering Epson XP-6000. I scrapbook and print a lot of pictures - refillable would be a big help. Does anyone know if this printer uses non-OEMs? Or can you recommend another good - affordable - one? Thank you in advance! 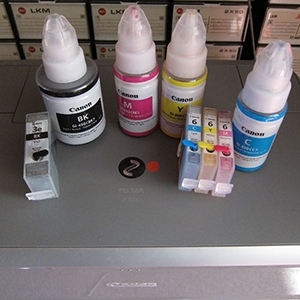 Before you buy any printer, check for refillable carts with ARC chips. I recommend refillable carts and not a CISS. Tanks, tubing etc. seems to always develop some kind of problem. Research and then Research again.